Apple today announced iPod Hi-Fi, an all-new high-fidelity speaker system that works seamlessly with the iPod to redefine the home stereo system. iPod Hi-Fi delivers breathtaking acoustic performance and room-filling sound unlike any other speaker system designed for the iPod in an innovative, all-in-one design that can be powered from a wall socket or by six D-cell batteries. 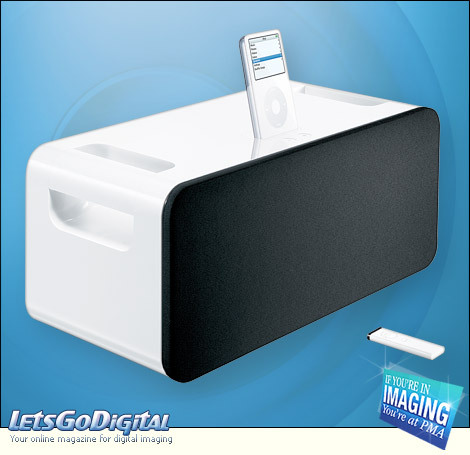 Apple iPod Hi-Fi is easily controlled by the Apple Remote for an amazing stereo experience in any room in the house. The Apple iPod Hi-Fi includes the Apple Remote, a removable grille, an AC power cord and 10 Universal Dock adapters, and is available for $349 US. 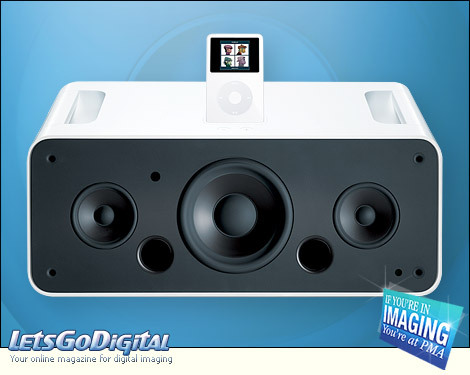 Apple iPod Hi-Fi - Speaker system - iPod Hi-Fi has been designed and engineered by Apple to deliver unrivaled sound quality, realistic sound imaging and optimal audio performance. Its clean, all-in-one design features a unique isolated enclosure system that includes two custom designed wide-range speakers and a tuned, ported bass system, minimizing vibration while maximizing sound quality and allowing users to listen to their favorite music as it was intended with amazing sound clarity and rich, deep bass. Apple iPod Hi-Fi features handles to easily transport your stereo anywhere, a removable front grille with precision-mounting clips, touch-sensitive volume control buttons, the Apple Remote for easy song and volume control from anywhere in the room, a universal power supply incorporated into the all-in-one design so there's no bulky power brick to weigh it down, and the ability to power Apple iPod Hi-Fi from six D-cell batteries for true portability. Apple iPod Hi-Fi - Home stereo - "Apple is reinventing the home stereo with the new iPod Hi-Fi, the first iPod accessory that adds true high-fidelity sound quality to the iPod," said Steve Jobs, Apple's CEO. "Apple iPod Hi-Fi's unrivaled acoustic performance and stunning design is at home in any room in the house." Apple iPod Hi-Fi - Features - Featuring seamless integration with all iPods with a dock connector, Apple iPod Hi-Fi automatically recharges your iPod while docked and displays features of iPod that maximize the iPod Hi-Fi experience such as Tone Control, Large Album Art mode and volume mirroring. Apple iPod Hi-Fi includes a dual-purpose 3.5-mm auxiliary input that accepts either analog or digital signals for easy connection to a wide range of audio sources. iPod Hi-Fi is compact and can be powered by AC or six D-cell batteries, providing more flexibility than any traditional home stereo and is perfect for use not only at home, but just about anywhere you go without compromising sound quality. Apple iPod Hi-Fi - Leather cases - Apple today also announced new luxurious leather cases designed specifically for the fifth generation iPod and iPod nano models. The Leather Case for iPod is made with fine, hand-crafted Italian leather and features a soft and durable interior lining for a secure fit, making it the perfect carrying case for iPod or iPod nano. Apple iPod Hi-Fi - Price & Availability - iPod Hi-Fi includes the Apple Remote, a removable grille, an AC power cord and 10 Universal Dock adapters, and is available for $349 (US). The Leather Case for iPod is available in 30GB and 60GB models as well as an iPod nano model, each for $99 (US). iPod Hi-Fi and all models of the Leather Case for iPod are available through the Apple Store, Apple's retail stores and Apple Authorized Resellers.